Price: £1.69 (incl VAT) Sorry, this item is currently unavailable. Click here to receive notification when this product comes back into stock. 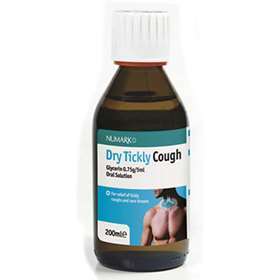 For the relief of tickly coughs and sore throats. Contains Glycerin 0.75g per 5ml. Syrup for oral use. Shake the bottle before use. Take one or two 5ml spoonfuls (5ml to 10ml). Take half a 5ml spoonful (2.5ml). The above doses maybe taken up to 4 times daily. Wipe the neck of the bottle and replace the cap securely without over tightening. Do not use if you are allergic to any of the ingredients or if you have difficulty digesting glucose or sucrose. Do not use if you are taking any other products containing potassium tartrate, carbonates or bicarbonates. Prolonged use may cause tooth decay or stomach upset. If you experience these or any other side-effects not listed, stop taking the product and tell your pharmacist or doctor. Consult your doctor or pharmacist before use if you are pregnant or breast feeding. If you have been told by your doctor that you have an intolerance to some sugars, contact your doctor before using this product. Contains a 5g of a mixture of glucose, sucrose and fructose per 10ml dose. This should be taken into account for patients with diabetes mellitus. This medicinal product also contains small amounts of ethanol (alcohol), less than 100mg per 10ml dose. Sucrose, Honey, Glucose, Citric Acid E330, Lemon Flavour, Sodium Benzoate E211 and Purified Water. Product code: 3799160 Price: £1.69 (incl VAT) Sorry, this item is currently unavailable. Click here to receive notification when this product comes back into stock.